Letter from Dr. Lindvall to members of the Caltech faculty RE: Encloses information on academic freedom including an article entitled "Should a Person Ask Immunity?" by Dr. Alexander Forbes, along with the response to this article by Zechariah Chafee, Jr. and Arthur E. Sutherland of the Law School. I am glad to have your letter, and to see year reprints, and to answer your questions. First, let me say that Professor Corey and I have found it desirable to make a small change in our structure, in a way pointed out by Professor Verner Schomaker. We have rotated the phosphate groups through 45° about their vertical axes. This brings one of the unesterified oxygen atoms out to about 4 A from the axis, and in a position where it might possibly be open to attack by a reagent, as suggested in your theory. I do not see (although I have not considered the matter thoroughly) why your mechanism has to be ruled out with a three-chain helix. I agree that in our original structure the two unesterified phosphate oxygen atoms are pretty well protected from attack, but in the new structure one of the oxygen atoms is out in the open, and I should think that the three-chain structure night work just as well as a one-chain structure. I do not think that there was any difficulty about replacing the phosphate hydrogens by metals, dye molecules, basic proteins, in the original structure, because it is not necessary that negative charges and positive charges that neutralize them be on atoms that are in contact with one another. There is some question as to the cross-sectional area of the DNA molecule. Astbury's estimate was essentially a guess. Our estimate is supported by a large amount of physical chemical data, and by x-ray data. I cannot be sure that the x-ray data require three nucleotide residues per 3.4 A. The data do, however, indicate very strongly that there are at least two residues in this length. I think that the indication for three residues is stronger than for two residues. Probably the x-ray data that have been gathered recently by the people in King's College, London, are good enough to answer this question definitely. I do not see any serious difficulty in the attack of enzymes on nucleic adds with our structure. I should think that little change in the structure of the nucleic acid would occur when it is liberated from the protein to which it is bound. I know that many people are working on the structure of nucleic acids now - especially people in England. It seems likely to me that within two or three years the problem will be definitely answered - that is, that the folding of the polynucleotide chains will be known. Perhaps it will turn out that our structure, with the small revision, is right, but perhaps some other structure will be found to be right. Letter from LP to Mr. Pucciarelli RE: writes in answer to Mr. Pucciarelli's enquiry that work on molecular structure has not progressed far enough to be of any value with respect to cancer. [Note from Mr. Pucciarelli to LP March 6, 1953] [Filed under LP Correspondence: Box #313, Folder #1]. Letter from LP to Theodore McClintock, W.H. Freeman and Company, RE: Discusses proposed corrections to the second edition manuscript of General Chemistry. Most corrections will be looked at when LP is in New York on April 2, 1953. 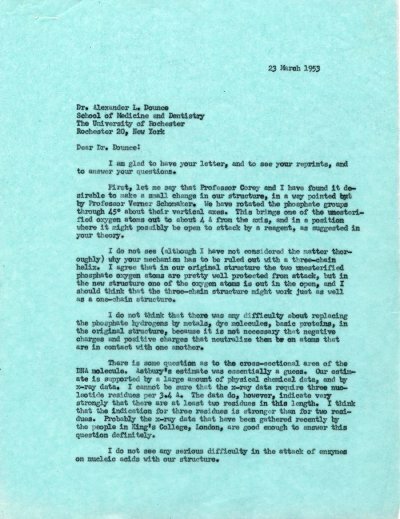 [In reply to March 18, 1953 letter from McClintock to LP]. [Filed under LP Books:1953b]. Letter from Mr. Dewey B. Larson to LP RE: in response to LP's letter, writes that he will proceed with the preparation of a paper on the compressibility of solids. Also wants to develop his liquid volume relationships further. Goes on to discuss his work with the effect of temperature on liquid volume. Explains his use of probability functions. Includes graphs of some of his work comparing volume and pressure between different compounds. [Letter from LP to Mr. Larson March 9, 1953, letter from LP to Mr. Larson March 30, 1953] [Filed under LP Correspondence: Box #212, Folder #12 (Larson, Dewey)]. Letter from Stanley Schaefer, W.H. Freeman and Company, to LP RE: Discusses design aspects of the second edition of General Chemistry, as well as the meeting time and place in New York. [Filed under LP Books: Box 1953b, Folder 1953b.1].